With a financial power of attorney, you can appoint someone to handle your financial affairs. You can draft the document so it applies to all of your property, and continues to be valid in case you become incompetent. Or you can grant only one specific power for a limited period of time, for example, if you know ahead of time you will not be able to attend to business for three weeks. Powers you can grant your agent include paying your bills, managing your real estate, managing litigation, and performing bank transactions. 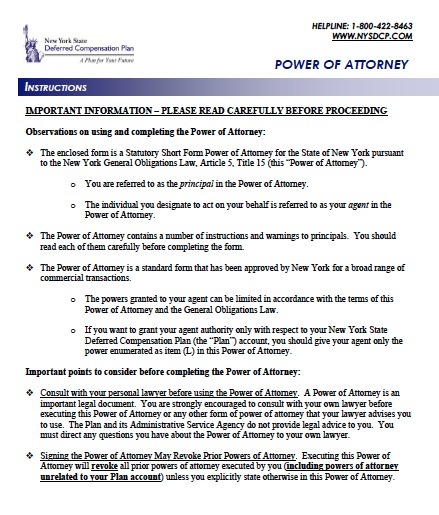 New York recently revised its power of attorney law, requiring forms to state that the agent assumes fiduciary duties and stating the legal limitations on the agent’s actions. In order to clearly inform the principal as to how much power the agent would wield over the principal’s property, the state also required a separate form that principals must use to authorize agents to make gifts with the principal’s property.